Started at the University of New Mexico Health Sciences Center in 2003 by gastroenterologist Dr. Sanjeev Aurora, Project ECHO (Extension for Community Healthcare Outcomes) is a movement to demonopolize specialist knowledge and amplify the capacity to provide best practice care for underserved people. It began by developing an educational model to train frontline primary care providers in rural/underserved areas of New Mexico to care for patients with hepatitis C in their own communities. 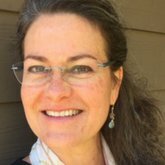 Using multisite teleconferencing, Project ECHO links specialists in a particular field at a “hub” with clinicians in local communities who are considered the “spokes” of the model. Together the hub and spokes participate in weekly videoconference “teleECHO” sessions (see Anatomy of a Project ECHO Session below) that allow for knowledge sharing and mentoring. Since 2003, Project ECHO has grown to more than 130 ECHO projects in the United States and internationally, covering 65 complex medical conditions and other problems. There are several standout palliative care ECHO projects, which include MD Anderson Project ECHO-Palliative Care Africa, Alaska Native Tribal Health Consortium Palliative Care ECHO, Northern Ireland Hospice Palliative Care ECHO, and Trivandrum Institute of Palliative Sciences Project ECHO in India. There are multiple other sites, both in the U.S. and around the world, in various stages of development for palliative care ECHO. We put together a palliative care specialist team that will include a palliative care MD, nurse practitioner, clinical social worker, pharmacist, and spiritual care expert. In addition, our project coordinator and data coordinator will be participating in all ECHO conferences. We are deep in the processes of recruiting participant sites in the Carolinas, developing a core curriculum, and planning our approach to data collection and evaluation. We will use QDACT, a point of care patient reported outcomes data gathering system developed by the Global Palliative Care Quality Alliance, to drive quality improvement. We are recruiting both palliative care specialists who are practicing in isolated or non-academic settings as well as frontline primary care providers who want to augment their palliative care skills. Thus far, we have received overwhelming support for this project from the palliative care community in the Carolinas, with multiple sites committing to join our ECHO community. At the end of January our expert team traveled to the ECHO Institute at the University of New Mexico Health Sciences Center for a three-day immersion course on all things ECHO. Learn more about Project ECHO immersion. After the sessions, the palliative care specialist hub team will be available to the spokes to continue discussion and recommendations for the cases presented and for mentorship. In essence, a learning community is formed that works together and helps others solve day-to-day patient care challenges in the field. What appeals to us about Project ECHO is the use of widely available videoconferencing technology to diffuse medical knowledge and best practices to frontline clinicians no matter where they practice or what their background. 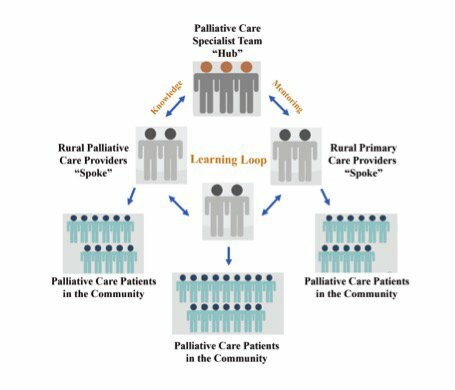 This learning/sharing model works as a tool for leveraging palliative care specialist level expertise by providing support, encouragement, and a safe place to improve our colleagues’ practices. The major barriers to access to palliative care—rural settings, limited access to consultants, lack of palliative care training, knowledge and skills, and the palliative care workforce shortage—are broken down with use of Project ECHO. If we can successfully use this guided practice model we will scale access to high-quality palliative care to many more seriously ill patients and their families. If we can objectively demonstrate the value of the Project ECHO model in palliative care in the Carolinas, then we can work with others towards a successful national expansion. We are pleased to give annual updates to the CAPC community as we progress. Email Dr. Elizabeth Burpee with questions or comments. The Center to Advance Palliative Care has a robust online curriculum and operational toolkits to help all frontline clinicians improve their palliative care knowledge and skills. For clinicians working in rural settings or with underserved populations, CAPC’s Building the Business Plan for Community-Based Palliative Care course includes valuable tools and resources for building a thriving, sustainable community-based palliative care program. The Master Clinician Series is a great way to connect with peers in the field for discussions around complex clinical issues, and Virtual Office Hours afford an opportunity to connect with experts in program design from a distance. To read a follow-up to this original blog post, click here.